Home › Email Scams & Phishing › Omniquad highlights Spam of the Week: Local Arrest Record Now Posted Online – Find Child Predators in your neighborhood! 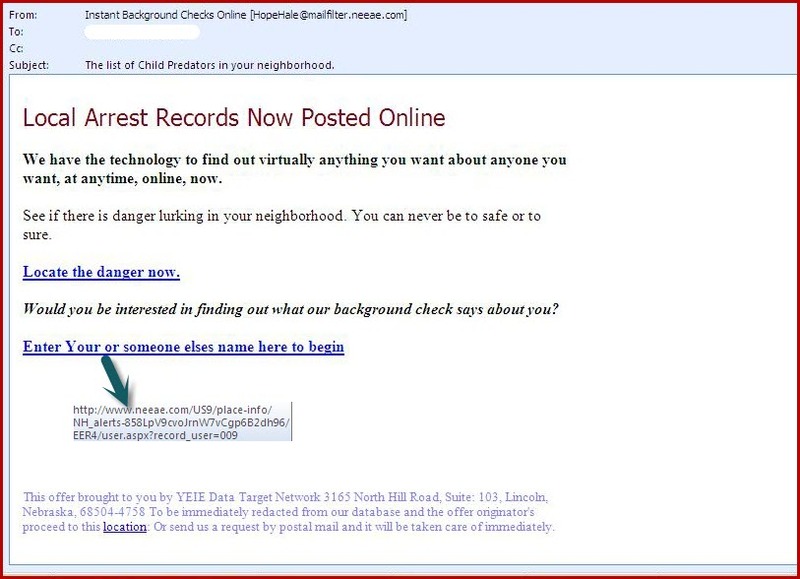 Omniquad highlights Spam of the Week: Local Arrest Record Now Posted Online – Find Child Predators in your neighborhood! Britains current focus on child abuse has inspired internet scammers to prey on our insecurities. We see a high number of spam pushing a service which claims to tell you about the arrest records of people living in your neighbourhood . The spam emails claim that local arrest records has been posted and can be found online, also claim that recipients can perform a background check about himself. It is designed to promote an online record checking service which will allows users to enter a person’s name and gather a detailed criminal history, contact and address information and other personal details. To retrieve a full report, users must sign up and pay a monthly fee. Do not sign up. You will get no detailed reports about criminals, you will have given your credit card details and personal information to cyber criminals instead! The subject field in the spam messages vary frequently. The hyperlinks in the spam emails open a website that offers users the ability to look up information about people by entering their name in a search field. However, to access the full reports, users are required to register on the site and sign up for a membership plan that charges a monthly fee to their credit card. Links in the spam emails usually only work for a few hours before they begin producing “forbidden” or “page not found” errors rather than opening the targeted site. Most of these spam emails were originating from Italy, and promotes a service based in the US. Protect yourself from email frauds/spam. – Always look for “https://&#8221; and padlock on web sites that require personal information.